The demand within the global market for fiber-reinforced composites has been rising on account of advancements across key end-user industries, finds Transparency Market Research (TMR). The market vendors in the global market for fiber-reinforced composites have shown a sense of anarchy towards adopting untested business strategies. Hence, the vendors within this market have stayed in control of their moves and have adopted a balanced approach to business growth and development. Furthermore, market players in the global fiber-reinforced composites market are also expected to earn voluminous profits in the years to come. This assertion can be attributed to the wide-application portfolio of fiber-reinforced composites. The global market for fiber-reinforced composites is expected to witness intensification in competition in the years to come. This is because of each of the vendors in this market are making stern efforts to increase their profit margins and attract a larger consumer base. 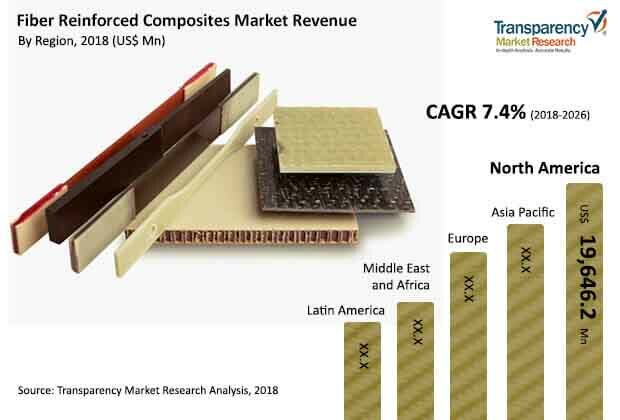 The medium-sized market vendors in the global fiber-reinforced composites market are expected to trace the footsteps of the established vendors. Some of the key players in the global market for fiber-reinforced composites are Kineco Kaman Composites-India Private Limited, RTP Company, and PLASAN CARBON COMPOSITES. Transparency Market Research (TMR) predicts that the global fiber-reinforced composites market would expand at a healthy CAGR of 7.4% over the period between 2018 and 2026. The cumulative value of the global fiber-reinforced composites market is also expected to increase by the end of the forecast period. On the basis of geography, the market for fiber-reinforced composites in North America has been expanding at a boisterous pace. Based on end-use industry, the automotive sector has been the most prominent consumer of fiber-reinforced composites. The global market for fiber-reinforced composites has been rising on account of advancements in the constructions industry. The use of new and advanced technologies in the constructions industry has led to the adoption of fiber-reinforced composites in recent times. Furthermore, fiber-reinforced composites are used as raw materials or intermediate products for the manufacture of several items. This factor has also played a major role in the growth o the global market for fiber-reinforced composites in recent times. The aerospace sector is amongst the most investment-heavy industries across the world, and several nations prioritise the growth of their aerospace industry. Hence, the use of fiber-reinforced composites in the aerospace industry is expected to bring in voluminous revenues into the market. The demand within the global market for fiber-reinforced composites has been rising at a stellar rate over the past decade. However, a handful of dynamics can transcend as threats to the affluent growth of the globa;l fiber-reinforced composites market. Fiber-reinforced composites need to be used with immense care and precision in order to add finery to the end-product. Even minor negligence can cost huge amounts of money that goes into repair and fixing of flawed end-products. Nevertheless, the use of fiber-reinforced composites in the electrical and electronics industry shall continue to propel market demand in the years to come. The review is based on TMR report titled, “Fiber-reinforced Composites Market (Product - Short Fiber-reinforced Composites, Long Fiber/Continuous Reinforced Composites; Matrix -Polymer Matrix, Metal Matrix, Non-metal Matrix; Fiber Type - Glass, Carbon, Aramid; End use Industry - Automotive, Building and Construction, Aerospace, Electrical & Electronics, Marine, Sports and Leisure) - Global Industry Analysis, Size, Share, Growth, Trends, and Forecast 2018 – 2026”.